Provide Support is glad to announce new software improvements which have been implemented recently. They include not only new features but also server updates which make our service more stable and secure. Please take a look at the below features description. 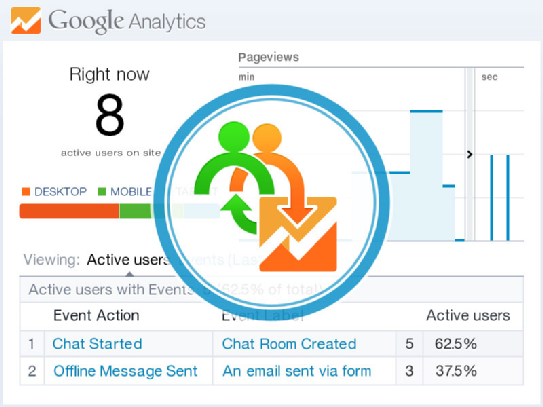 Pushed events are displayed in Real-Time / Events and Behavior / Events sections of your GA report. 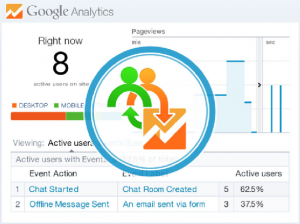 To enable events tracking you just need to follow Account Settings / Google Analytics Integration page and insert your GA tracking ID there. Possibility to change console status from online to away. If an operator changes the console status to away, he / she will appear offline to website visitors and will not receive new chat calls, but will be able to finish all active chats. File transfer feature. Operators can transfer files up to 100 MB from the web based console. Captcha field. This type of field can be added to the pre-chat form to protect from chat messenger floods and bot attacks. It can be added on the Account Settings / Start Chat Form Fields page. More updates are coming and we will be glad to inform about them at the nearest time. This entry was posted in Instructions, News and tagged google analytics integration, live chat and GA integration, live chat console, Live Chat features. Bookmark the permalink. 2. Allow to fully disable the sound option for visitors, to avoid any errors generated by the lack of “Quicktime”. 3. Allow to set as Default a canned response for proactive chat option. This means that we could select a canned response that will appear by default when clicking on the ProactiveChat option. 5. Allow to select multiple visitors or chat tabs at the same time and send an invitation with a Greeting or canned response to those selected ones. 6. Autosend invitation to visitors (ProactiveChat). 7. Allow HTML on canned replys. 8. Allow inline chat in the same webpage (Not popup). Thank you for your suggestions, Jose. Some of these features are already in our TODO list and hopefully will be available at the nearest time. We will keep our customers updated.